Addison Moore crafts a tale of girly goodness in Ethereal. If you enjoyed the Twilight series, the Vampire Diaries or just enjoy a good paranormal love story then you will most certainly like Ethereal. 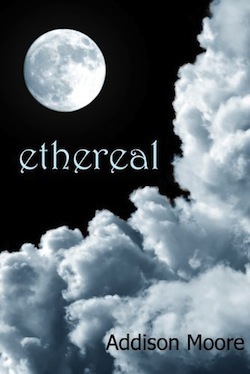 Ethereal tells the story of young girl named Skyla who moves from sunny Los Angeles to foggy Paragon Island off the coast of Washington with her mother, sister and new step father and siblings. Once on Paragon Island Skyla discovers that she is special in many ways and that she is not alone, especially on the island. There she meets two handsome cousins, who both vie for her attention while trying to keep her safe from some of heavens darker elements. I really enjoyed reading Ethereal. It was a different take on the angel genre, that also had a strong, non whiney female lead that wasn’t content with just sitting around and waiting for whatever fate has in store for her. Plus lets be honest what girl doesn’t like to read a good love story? We can all relate to that feeling of being swept up in the good looks and charming personality of a new boy. And then you throw in the supernatural/ sci-fi element and that love story becomes an intriguing tale of mystery and suspense. Follow Skyla on her journey to discover who or what she is and what that will mean for her future and the future of her relationships. If you are looking for a good romance with strong sci-fi elements then you should definitely pick up Ethereal. You will not be disappointed!